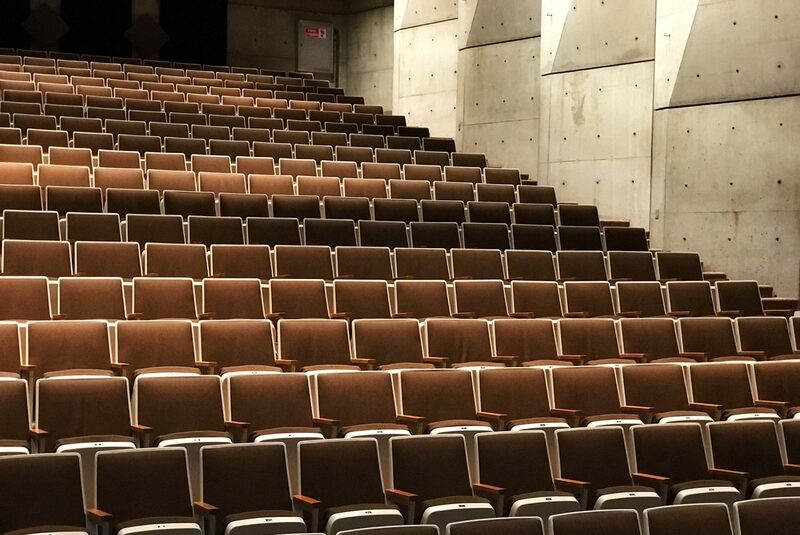 This year, the Nereus Program will hold a seminar series with UBC’s Green College on “Adapting to global changes in oceans and fisheries.” This series will consist of seven lectures looking at how ocean changes are affecting environments and people. The first three Fall seminars are listed below, four more will be announced soon. The seminars are all open to the public free of charge and will be held at UBC, at 6201 Cecil Green Park Road, Vancouver, BC, Canada. Series description:The oceans are changing at an unprecedented rate because of human activities, particularly through climate change, fishing, pollution, and habitat destruction. There is a growing concern among marine scientists, policy makers and stakeholders over the loss of biodiversity and ecosystem services, and the capacity to produce seafood. Given the scale of these environmental changes, it is imperative that we understand the responses, vulnerabilities and impacts of this changing ocean to develop strategies to adapt. We aim to provide a concise overview of the latest research findings about the state of the oceans and the projected future conditions under climate change, as well as the implications for biodiversity and fisheries, case studies on vulnerable regions and communities, and how market-oriented solutions and international policies can facilitate adaptation. This seminar series will bring together experts working in a diverse range of fields, from ecology and indigenous knowledge to economics and technology development, to engage in discussion on equitable and socially just strategies for adaptation to global changes. The ocean is changing and human society needs to adapt. What is the scale of this change and what will be the impacts? The current paradigm for adaptation needs to be changed to tackle the co-emergence of environmental impacts and societal concerns. How will we adapt to this new ocean? The first talk of this seminar will set the premise of this seminar series — the changing ocean and our pathway to adaptation. 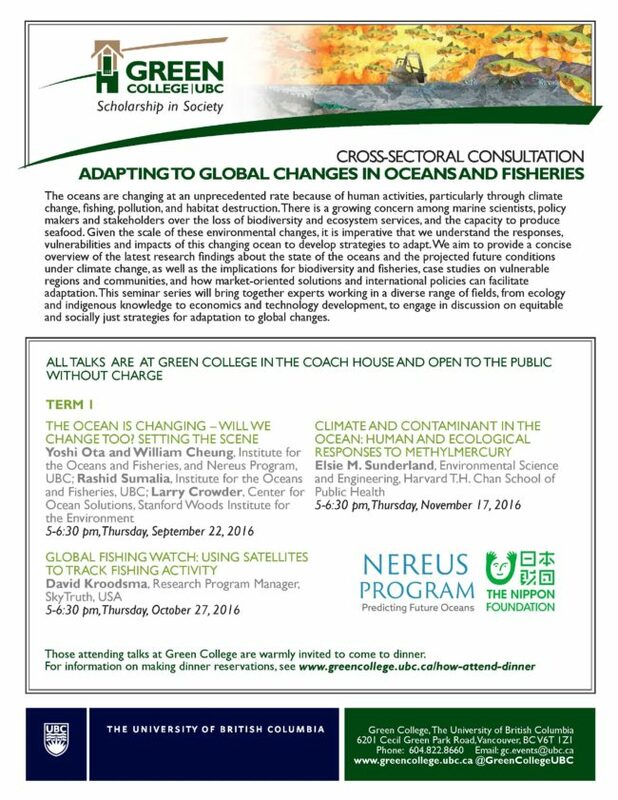 Dr. Cheung and Dr. Ota, directors of the Nippon Foundation Nereus Program, will provide talks from both the natural and social science perspectives to explain the future state of oceans and fisheries. Invited guests will provide their perspectives in a panel discussion. Can we have eyes in the sky to monitor global fishing efforts? The Global Fishing Watch uses remote sensing collected by satellites to expose the impact of fishing. Global Fishing Watch is the product of a technology partnership between SkyTruth, Oceana, and Google that is designed to show all of the trackable fishing activity in the ocean. This web tool is being built to enable anyone to visualize the global fishing fleet in space and time. David Kroodsma, Research Program Manager at Skytruth, will reveal the intensity of fishing efforts around the world, one of the stressors contributing to the decline of global fisheries. Then he will discuss how we can protect our fisheries, which are a common resource, whether on the high seas that belong to everyone, or in the sovereign waters of individual nations. Many environmental contaminants biomagnify in marine food webs, reaching high concentrations in top predators, posing health risks to humans and wildlife. Biomagnification is highly affected by dietary preferences of different species and locations of food foraging activity. The combination of climate driven changes in ocean conditions and fish harvesting activities by humans is causing major changes in marine food webs that also affect contaminant biomagnification. Using the example of methylmercury, a potent neurotoxin found ubiquitously in most marine environments, this presentation will explain how climate, global emissions and contaminant concentrations in marine food webs are intricately linked. The presentation will also discuss of the effectiveness of mitigation measures aimed at protecting human health such as emissions controls and dietary advisories for different fish species.